Growing up with NASA almost in his backyard and a father employed in the space industry, Brad Bell might have become an astronaut. Instead, Brad is on the cutting edge of technology as the director of the Digital Architecture Research Consortium (DARC) at the University of Texas at Arlington, where he researches and teaches about the integration of advanced digital technologies into the architectural design process, with a focus on digital fabrication and cast materials. He is also the director of the School of Architecture at UTA’s College of Architecture Planning and Public Affairs (CAPPA). Brad has lectured, taught, and written on CAD/CAM technologies, and he is the co-director and founder of TEX-FAB, an organization committed to providing a platform for education on digital fabrication and parametric modeling to the professional, academic and manufacturing communities in Texas. 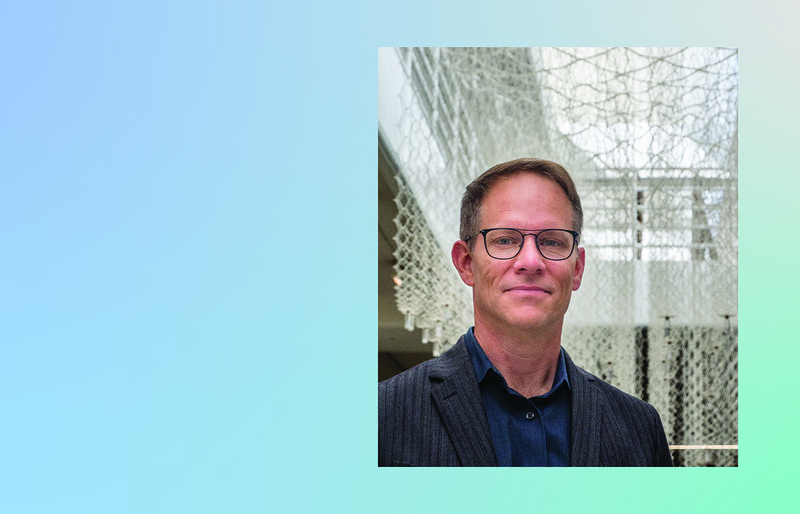 Brad was awarded the UTA President’s Medal for Teaching Excellence in 2015, and he serves as the lecture programming chair for the Dallas Architecture Forum. I was pleased to visit recently with Brad, a leading voice on architecture, technology and fabrication, and share more about him and his insights with Columns readers. Brad, tell us some about your background. I grew up in Clear Lake City, Texas, a suburb of Houston, not too far from NASA. My dad was a computer engineer who worked on the Apollo and Skylab space programs. I have memories of visiting the Mission Control room with my dad when I was a kid and going to see one of the mainframe computers at IBM that ran off of punch cards. While these things seemed perfectly normal then, in hindsight they were unique experiences and probably shaped my thinking about technology from an early age. Math and art were my favorite subjects in school, so I guess I had both left and right brain interests from a fairly young age. What influenced you to become an architect? I took a drafting class in high school where I drew plans and built models. When I realized I could do the same thing in college, I was sold. Of course, as I got older and started to see great buildings as I traveled, this is what transformed casual interest into a passion for design. Where did you attend college, and what did you enjoy studying? I went to Texas A&M since it wasn’t too far from home and had a good architecture program. Much of the studio work at A&M was focused on smaller scale projects with an emphasis on craft and making. At the time I was there in the early ’90s, the school had an influx of younger faculty with new ideas and new teaching methods. As a result of this group of faculty, I became interested in pursuing graduate studies at Columbia University, where there was a chance to live in a larger city and expand my interest in digital applications. I graduated with a bachelor of environmental design from A&M and then enrolled at Columbia to obtain a master of architecture degree from the Graduate School of Architecture Planning and Preservation at Columbia. Bernard Tschumi had just introduced the paperless studio the year before I arrived in 1995. Instructors like Greg Lynn, Stephen Holl, Manuel Delanda, Hani Rashid, Stan Allen, Lauri Hawkinson, and Kenneth Frampton were all debating the role of the computer in the design education at that moment. It was a great time to be there. While I was at Columbia, I decided to pursue a career focused on the academic side of the architecture. I stayed in NYC one year after completing my work at Columbia and then became a member of the faculty at the University of Colorado at Boulder, where I taught until 2000. What brought you to the University of Texas at Arlington? I joined the faculty at Tulane and taught there for five years until 2005. I became friends with Don Gatzke, FAIA, who was the dean of the architecture school. After Don accepted the position of dean of the School of Architecture here at UTA, he asked me to join him. I have now been at UTA for 13 years and have been able to expand the school’s curricula and facilities focused on both digital computation and fabrication. Tell us about TEX-FAB and the Digital Architecture Research Consortium (DARC). I have been fortunate to collaborate with architecture school leaders at other universities in Texas to develop the TEX-FAB Digital Fabrication Alliance, which is a creative network connecting professionals, students, and the AEC industry to advance the discipline of architecture in its adoption of parametric design and digital fabrication. Between 2008 and 2015, we set up digital fabrication competitions and symposia, and our alliance now includes the University of Houston, UT-San Antonio, and UT-Austin in addition to UT-Arlington. We are currently working on a new website and planning our next conference in 2019. The Digital Architecture Research Consortium is a network of strategic industry partners in North Texas that have joined UTA’s College of Architecture Planning and Public Affairs (CAPPA) to conduct directed research into ways computational fabrication will transform the AEC profession. DARC is based at UTA, and it connects with AEC firms including HKS, Beck and other local industry leaders. What projects or initiatives at UTA have you enjoyed the most? We have been able to expand the reach and focus of DARC with the addition of two faculty members. Our team is focused on additional research on building performance analysis, structure/material optimization, computational architecture, building skins, and exo and endoskeletons of structures. More recently, I have really enjoyed continuing to help develop the Design+Build program. Parallel construction is a great new initiative that has taken the next step in development, thanks to the partnership of folks like John Mullen, FAIA, the Housing Channel in Tarrant County, Wall Homes, and Wells Fargo. Together with our faculty and students, we are designing and building a new 1500-square-foot house neat AT&T Stadium. Dr. Adrian Parr joined the school as its new dean last summer. How do you think the new dean will impact CAPPA? We are very excited to have Dr. Parr join us. She brings a tremendous interdisciplinary track record from the University of Cincinnati, where she was recognized internationally for her work in sustainable urban communities through her position as the director of the Taft Research Center for Humanities. We are looking forward to how her leadership and current position at UNESCO and connection to USAID will translate to helping shape a bold new vision for our programs and students at CAPPA and North Texas. I met my wife through a mutual friend in New Orleans. She is from Midland, Texas, and attended A&M as well, but we never quite crossed paths. We have a son who is 17 and attends Jesuit. He plays baseball and football and has threatened to become a UT Longhorn. We have two daughters, ages 9 and 10, who attend Wesley Prep. They both love art, dance, and making their dad laugh. My kids would say my hobby is making things. I am not sure if that is a hobby or a habit. Lately, my hobby is making renovations on our mid-century modern house. That project may never end. I commute from Dallas to CAPPA and back, which allows me some time reflect and to shift roles and be a dad at home. I also coach soccer and softball teams for my kids. I like to travel when I get a chance. I am a sports junkie. I like to cook. What books are you reading or have you read recently that you found interesting? The Tao of Bill Murray. Some forms of rock and blues. I played drums in a band in college. We weren’t great, but we had a ton of fun. We have a drum kit at home, and I still play sometimes with my son, who is a really good guitarist. If this professor thing doesn’t work out, there is always getting the band back together! Let’s hope it doesn’t come to that. What are some of North Texas’ strengths? It’s entrepreneurial. There is a low barrier to trying to do things, where there are higher barriers in other metro areas. There is also a strong sense of community in many areas of North Texas. You also have to love the people. What are some key areas where our region needs to improve? A major factor is that we’re not building and developing in a sustainable way. Transportation, affordable housing, and walkability are areas of need. We have to update our thinking to prepare for the continued rapid growth in the area. There’s also a need to improve diversity in where/how we work, live, and play. In the United States, Chicago is a great place to spend time. I also really enjoy Seattle and San Francisco. In Europe, Helsinki and Barcelona. I was recently in Hong Kong and can’t wait to go back. Which architects and styles of architecture have influenced you the most? This changes as I get older. Early on it was Lou Kahn, then later probably Renzo Piano for his work and Bernard Tschumi for the academic framework. I like contemporary architecture but also look at historical projects as a part of my academic research. What advice would you give to a student just graduating from architecture school? 1. Seek out mentorship at every stage of your life. It is always a good idea to know someone you can go to for advice and counsel and, in turn, recognize that you too need to be pro-active in mentoring others, like the students who are still in school behind you. 2. Never stop seeking out inspiration. I think design, creativity, and innovation come from inspiration. All too often we stop seeking out the places, people, experiences that inspire us as we graduate and head off to the professional world. This search should never stop. What are the greatest challenges facing the architecture profession and schools of architecture? The profession and academia are wrestling with the same issue on some level: speed. Within the profession, the production, integration, and complexity of information processing in today’s world have the potential to make historically slower procedures like architectural design and building construction become attenuated. Similarly, the education of an architecture student has historically been a slower process, but today’s students enter college already moving at warp speed. Today’s college students understandably have a lot of energy and momentum to engage big issues. They are also very interested in breaking down silos, engaging hybridized platforms, and embracing flexibility. I am not sure academia is keeping up with this demand at the moment. How the profession and academia adapt and mobilize to these changes will be very important. I’m lethal with a golf club in my hand (and not in a good way). Interview conducted by Nate Eudaly, Hon. AIA Dallas, executive director of The Dallas Architecture Forum.